As summer break arrives for the students, Jun Sakurada is busily studying on his own in the library, making up for time lost while he had confined himself to his home. 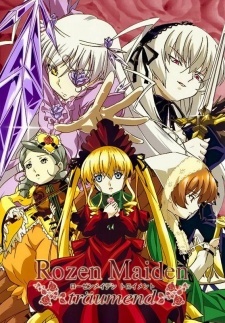 Meanwhile, his Rozen Maiden doll, Shinku, has been having troubling dreams of late. The pain and sadness of defeating Suigintou was overwhelming, despite the inevitable battle they waged. After waking suddenly from a nightmare, she finds Suigintou's companion spirit wandering; upon giving chase, she discovers that the seventh Doll-- Barasuishou-- has awakened. She now realizes that Suigintou's fate may very well befall the other Dolls, for the appearance of the last Doll signals the beginning of the end of the Alice Games.